Enchanted as I have been by the large swatches offered by the Learn to Knit Afghan squares, and feeling like a project, I decided to make a headband/neck warmer from each skein and compare results. The Andean Silk version is the only one I've worn. The yarn is a worsted weight of 55% alpaca, 23% silk, and 22% merino. It produced a gauge of 5 stitches to the inch in basket weave pattern on # 7 needles. I cast on 99 stitches and used the entire skein of 96 yards (a little skimpy there if you ask me). Everything about this product is my favorite: favorite color, favorite stitch pattern (next to moss stitch), favorite yarn - so soft and luxurious. BUT. The basket weave shows up well in this yarn, but it is almost flat compared to the wool version I did for the Learn to Knit afghan. It needed no blocking. That is a clue, I think, that the yarn is stretchy. When I wore it, it was uncomfortable, tending to creep downward toward my face. Remember, I like head gear that doesn't move. I think it will make a nice neck warmer. What would I knit with this yarn? I'm not sure. I would be afraid to make a sweater that needs to hold its shape. I guess a scarf or blanket that doesn't need firm stitch definition. 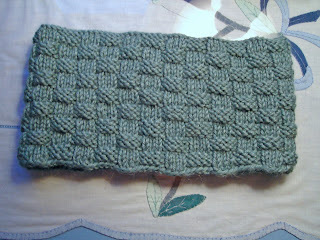 Above, the unblocked stockinette swatch is on top, unblocked headband on the bottom. 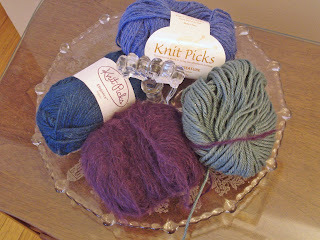 After Suri Dream, all of these yarns were a dream to knit in stockinette. The stitches are remarkably even without blocking. I didn't block any but one of the headbands, and I am a fanatical blocker. Thanks to Anne for the last delightful post. I've knit a sweater from Andean Silk (gold cabled v-neck) and had no trouble at all with stretching. Although the cables do lie flatter than they might with wool, the sweater overall has a clingy fit. Might be partly because I used #5 needles, somewhat smaller than is usual for worsted yarn. It's definitely my favorite sweater -- soft and cozy and incredibly warm.